Corwin Perren, electrical team lead, and Billy Edwards, team leader for the Mars Rover, traveled with three other teammates to the 2014 Sample Return Robot Challenge in Worcester, Mass..
Five members of Oregon State’s Robotics club on the Mars Rover team took their finals early so they could travel this week to Worcester, Mass. for the 2014 Sample Return Robot Challenge. The event on June 9 to 14, is hosted by NASA and Worcester Polytechnic Institute and has nearly $1.5 million available for prize money. Before leaving, the team disassembled the robot and each packed part of it into their luggage to avoid the costly shipping charges. For a team that is concerned about expenses, the prize money is a big incentive. “Building a robot from scratch is a pretty expensive venture. So if we can win some money at the competition, then we can concentrate more on the engineering and the project itself,” said Billy Edwards, Mars Rover team leader and junior in mechanical engineering. The money would go towards scholarships, projects, and supplies for the lab. During the challenge, the robot must work on its own to find a specific object in a park and return it to a designated point. The autonomous robot is guided by a computer program, and the team members are not allowed to control it during the task. The idea is to simulate conditions on Mars where GPS is not available, so the robot navigates by using cameras and other sensors. The competition has two challenges. For the first challenge there is only one object to retrieve. Those robots that are successful compete in the second phase which has multiple objects. The week-long event also includes demonstrating the robot to the public. 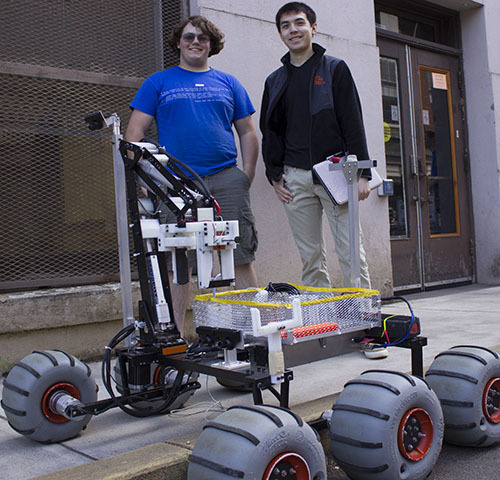 The Mars Rover built by the Oregon State Robotics club. Joining Edwards on the trip is Corwin Perren, electrical team lead, Lane Breneman, software team lead, Richard Cook, software senior design team member, and Erich Merrill, software senior design team member, all from the School of Electrical Engineering and Computer Science. Beyond the prize money the team is excited about representing Oregon State. 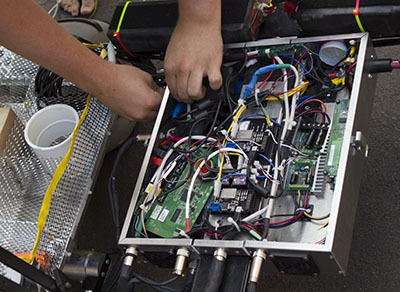 “We want to show that OSU has successful teams and very good engineers. We want to show what we can do,” Edwards said. Posted in Events, Student Stories.